Stranger Things #1 Review - Promising! Verdict: 3.3 / 5Capturing the spirit of the show whilst attempting to add something new, Stranger Things #1 successfully continues what works about the TV equivalent but has a lot of room to grow from it. A welcome addition to the universe, helping to flesh out Will’s story a little further, Stranger Things #1 centres itself around the lost boy as he finds himself in the upside down, unable to return to home and faced with the many dangers that are set to oppose him. Adding additional wrinkles to the TV show and showing us the experiences of the boy, it successfully captures the retro vibe of the series, thought bubbles and all for the ’80s theme, whilst grounding the story in some contemporary narrative techniques. The writers here, eloquently and intelligently, intercut moments from the Netflix show and original content to weave a new version of events here. Tying in the theme of Dungeons and Dragons to help keep the story relevant to a young person of this era, with some inventive artwork for the game throughout, number one expertly shows how a kid of his age would cope with the extraordinary circumstances he has found himself in. As the issue moves its way along, we see famous moments from the show that have been relayed to us through Will’s perspective. Particularity noticeable ones include the emergence of Eleven, who can see Will briefly in the upside down and can later communicate with him (with nods to this seen in the TV) and the moment he picks up his walkie-talkie, finally getting through to his mother, before the Demogorgon attacks. 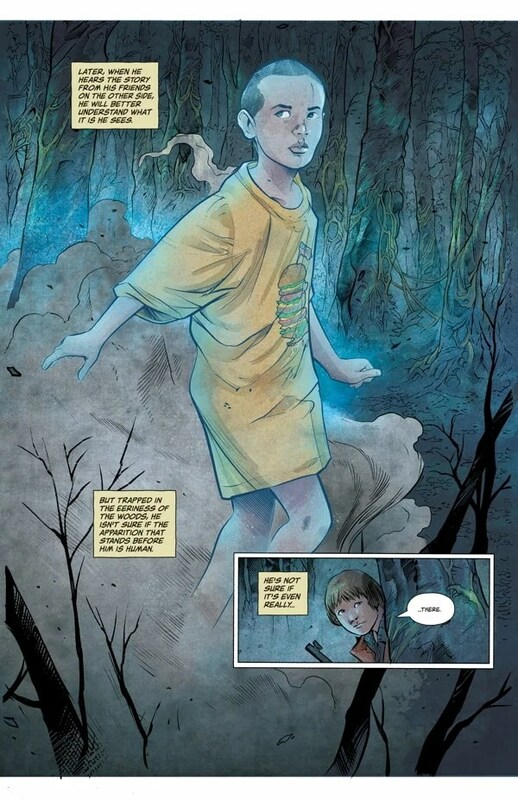 Dark Horse has been very clever here in using this title to get fans of the Stranger Things TV show into a new medium, allowing them to enjoy the unique storytelling opportunities that comics have to offer. 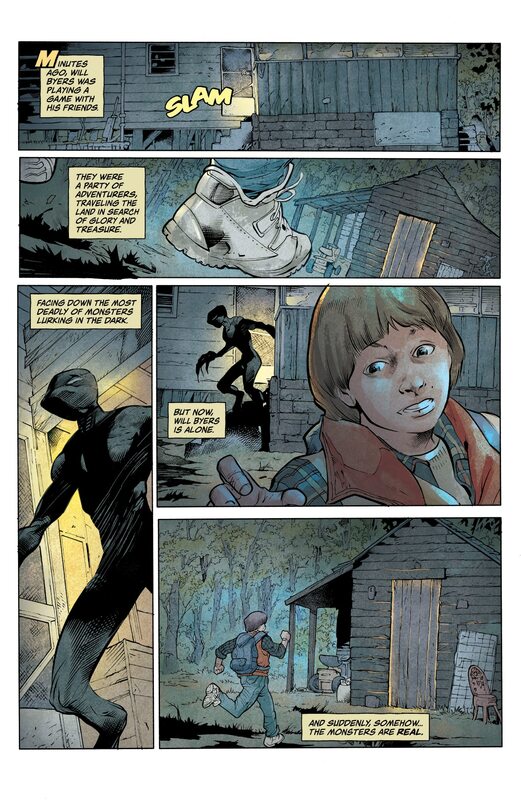 Whilst this is only a 4 issue mini-series focusing on Will’s time in the upside down, I wouldn’t be surprised if we see more content such as this available down the line. What I would like to see more of, is further original narrative points that are separate from the series. Thus far, the story has been moved forward by what happened on the show, with all the points’ in-between able to be filled in by fan’s imaginations. For the comic to surpass any expectations of it being a generic adaptation, it needs to continue to add more to the universe and continue to showcase how the medium can add something to the story already so well told on the silver screen. Stranger Things #1 continues to recapture the essence of the series through fantastic art and storytelling cues taking straight from the screen, however, to continue to grow and improve, it must focus on other original opportunities. For now, this is a quality start, but with many more opportunities for future development.